Click here for Brett's corporate comedy page and video.  Return engagements at The Kennedy Center and The Pentagon. At the Kennedy Center, I had the place to myself.  Laughing Matters with Brett Leake is picked up by American Public Television marking its fifth consecutive year of distribution to the nations public broadcasting stations. - Virginia Public Schools convocation season: Chesapeake City Public Schools; Poquoson City Public Schools; New Kent and Lancaster Public Schools; Greene County Public Schools. 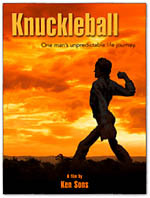 for the time, effort and heart you put into Knuckleball, a story of change and perseverance featuring my family. The product of three years of striving Knuckleball has been accepted in film festivals from Florida to Montana including The Sarasota Film Festival where I was lucky to attend and join with Kens many loving friends in a standing room only tribute to his accomplishment. Before setting out on my drive to attend the premier I sat in as Dad watched the DVD at home after which he said, Thats my story.... Thank you, Kenny and congratulations to you and Sheila on the release of your most recent production, Kila Marie. Shes beautiful. - My first view of The Grand Canyon from the south rim is preceded one day earlier by a drive on Interstate 64 across the New River gorge in West Virginia providing, in light of their similarly aged (relatively) strata, a nice contrast between the now passive eastern margin and the then passive western margin. - A ride up a portion of Schnebly Hill Road in Arizona where I got a good look at the big red sandstone layer missing 150 miles north at the Grand Canyon and that at Sedona is the center of the vortex and keeps em coming back from around this globe and others light years away. - The Columbia Icefields along the Alberta/British Columbia, CA. The Icefields Parkway has been called the most beautiful drive in the world and of the million miles Ive been lucky to drive I cant find fault in the claim. Youll never see thrust sheets the same way again. - The Selma chalk and its economic relationship to the Voting Rights Act of 1965.